I’ve talked about before how important it is to get out of your comfort zone and try new types of yoga. While I didn’t fall in love with Bikram Yoga, it was still a learning experience (and it answered a lot of assumptions). Earlier this month I decided to try out another type of yoga I’ve always been curious about: Anti-gravity yoga. 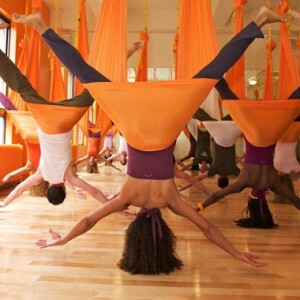 Anti-gravity yoga was invented by an aerial dance artist, who took the silk hammocks that they used for dance and brought them much closer to the ground. Think Vinyasa yoga with the aid of a hammock to gently encourage your body deeper into your each stretch. I did a week long trial at OM Factory in Manhattan, and from the first class I was hooked–I was there every single day (and it’s an hour commute!) I’m usually not a huge fan of inversions beyond shoulder stand, but the support of the hammock made inversions joyous and much more accessible. The hammocks also lent themselves perfectly to the restorative class (Baddha Konasana becomes “womb pose”, you swing gently back and forth as you relax). Even ab strengthening exercises in the “Flying Fitness” class were transformed from grueling to playful. I don’t think I’d solely practice anti-gravity yoga, for me a practice rooted in Vinyasa flow is what suits me best, but I would love to add a little flying into my practice every week. Anyone want to buy me a class pass or membership?